In comparison to other methods like the “Wilhelmy Plate method”, the “DuNouy Ring Method”, the “maximum pull force method”, the “spinning drop method” or the “bubble pressure method” the pendant drop method can be easily applied to pressure cells and furthermore small differences in vapor and liquid density do not hinder the measurements. 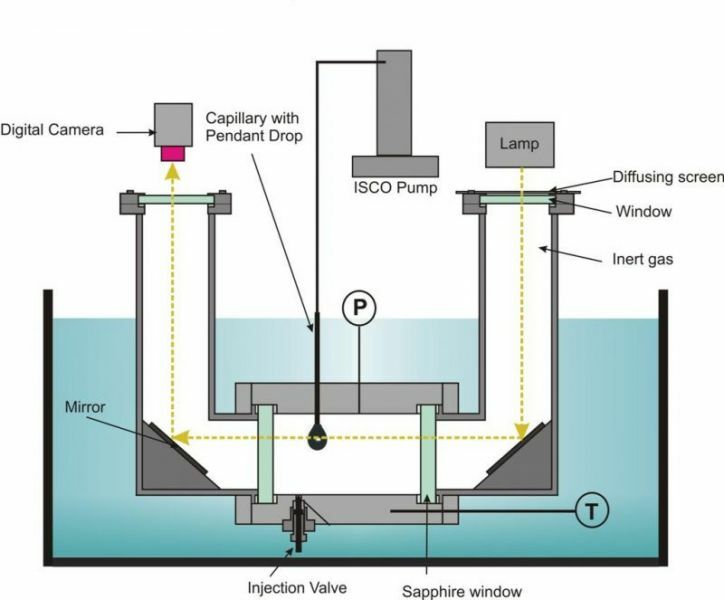 A commercial drop shape analysis system is connected to a pressure cell. 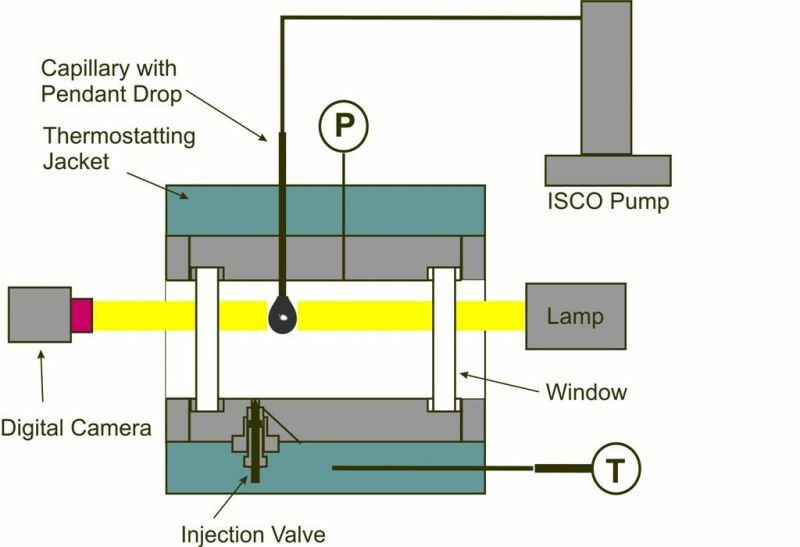 A schematic view of the measurement system is shown in the figure below. 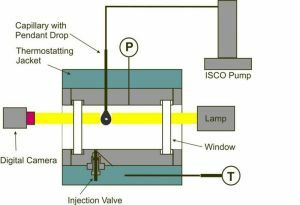 A capillary with a specific diameter and surface condition is placed inside the pressure cell to produce a hanging drop of a liquid in the cell, which is filled with the saturated vapor of the same mixture or a certain gas pressure. Sapphire windows are assembled at two opposite sides of the cell to allow a video analysis of the drop and to determine the interfacial tension by drop contour analysis. The apparatus is equipped with an injection system for liquids and gases, and it is also possible to visually observe the content of the cell. 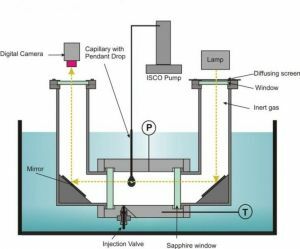 For measurements of surface tension data at lower temperatures the pressure cell can be modified in order to avoid fluctuation in temperature and the condensation of water on the sapphire windows of the cell, which hinder the optical detection of the drop. The modified pressure cell is equipped with two optical tubes on each window deflecting the light beam. In each of the two tubes a tilted surface mirror for low temperatures is placed which allows the detection of the drop rectangular to the cell with a special object lens. The tubes are filled with dry argon to avoid condensation effects on the windows and mirrors. This modification of the set-up allowed placing the cell inside a liquid cryostat for homogeneous thermo-regulation (see figure below).